First settled during the 1830s around a plantation of the same name, the community held a post office from 1897 through 1904. There had been a school which merged with the ones in Maud in 1900. Other than this, there seems to be no additional history or population figures. The town was dropped from maps long ago and according to the Handbook of Texas, it had �ceased to exist as a named community� by the 1980s. I would like to add information about the community of Poer, Texas that once had a school and a post office and a store about two miles east of Simms, Texas on highway 67. My father was born in Poer, Texas in 1905. His name was Clarence V. Poer and he was delivered by his father, Dr. John Franklin Poer. That is written on his birth certificate. The original plantation was owned by Martin A. Poer who received the land grant of 1280 acres in 1837 from the Republic of Texas. The post office existed until Dr. John Franklin Poer died in 1918. Poer, Texas is now called Old Union Community and receives rural mail delivery from Simms, Texas in Bowie County. 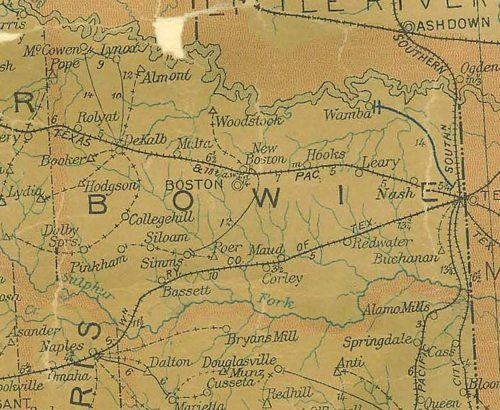 A letter that was post marked "Poer, Texas" could be put on the train at Carbondale, Texas about a mile east and arrive in New Orleans in two days for 2 cents. The school existed until it was consolidated with James Bowie High School in the Simms Independent School District in 1939. The school in Poer had only 6 grades. There were two churches, the Primitive Baptist Church and the Missionary Baptist Church. There is a large, well-kept cemetery next to those churches where the original settlers are buried. The members of the community still have an annual reunion picnic every Memorial Day with a business meeting in the old Primitive Baptist Church and a military memorial service by the veteran's monument. Descendants bring their lunch and eat in the large pavilion under the oak trees.